Tomorrow is a big day at Fortos Fort up in Willow, Alaska. It is when we start the tear down and begin to re-roof the cabin. We knew when we bought the place that one of the first things that we needed to do was replace the roof. Right now it is a mix of tin (what most homes use up here) and rolled shingles that was put on in patches, presumably either when the previous owners could afford it or it just had to be done. Thankfully there are not too many leaks in the roof. That is a good sign that the under-lying sub-roof (or what ever it is called) is in decent shape. During the extremely wet, and rainy months last summer the roof did leak in just one place– where the tin met the shingles. That is to be expected with the shotty job the previous owners rigged up. The roof did hold up to the snow and ice all through the winter and that was surprising. I dont know how many times I thought I would come home to see it caved in! So even with a tight budget, we knew that this was a job that we had to do so we have been saving and saving. With a very tight window of just a month or so before the rain starts in mid-June we are ready to get to work. Our cabin is not your typical cabin by any stretch of the imagination. The roof line has more peaks and valleys than two or three homes combined! We have dormers, abuttments, steep peaks and what seems like miles and miles of trim that is over 20 feet tall in some places. We quickly learned that it was not in our budget to replace the roof with a new tin one. It was going to cost almost 10 grand just for materials. So, we decided to go with Arcitectual Shingles. These are a three tab style like you will find on most shingle roof homes but they have a slighlty different pattern on each tab giving it almost a tile effect. Natural Wood. With all the trim to be painted in the barn red color. 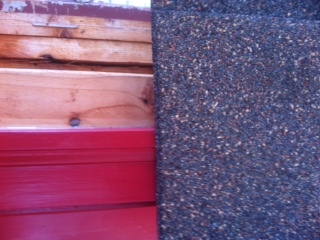 The only choice seemed to be the Natural Wood shingle. Follow our adventures of Forto’s Fort up here in the “wilds” of Alaska as I attempt to make this cabin our cozy home and the future home of Team Ineka sled dogs!